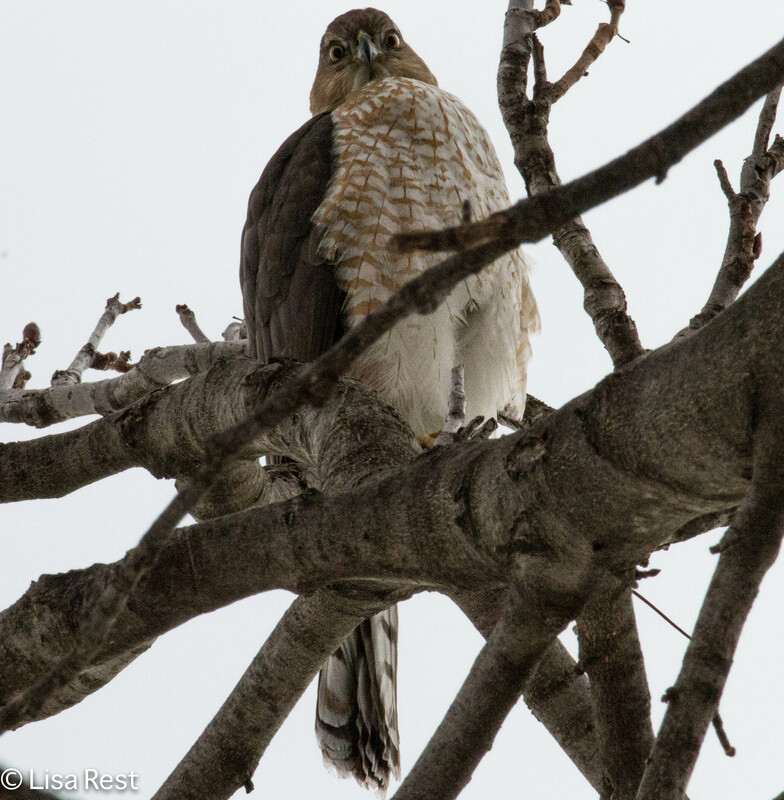 I haven’t been going very far on the weekends through the snow and cold, but I’m still drawn to the outdoors on whatever scale, so I guess that might explain why I have managed to see the local Cooper’s Hawk more frequently this winter. The bird doesn’t always stay for a photograph, but almost two weeks ago I managed to take these. I first went around the other side of the house to get a picture of the sedum as I have never seen it. Then I ventured around back to see what was going on there. 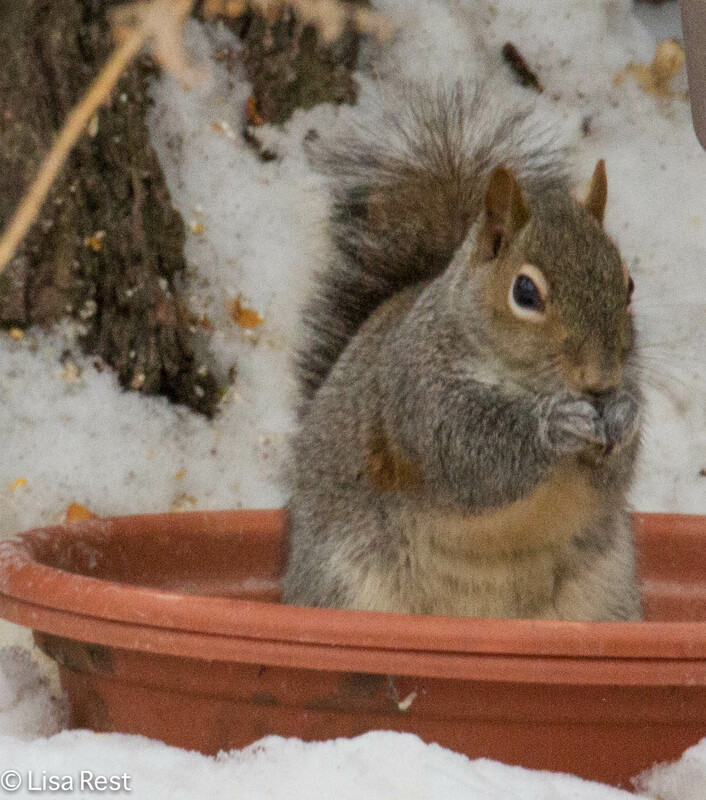 No birds at the feeders, but there was this squirrel eating sunflower seeds by the horse chestnut. The squirrel looks almost like a grey-fox mix to me but it’s most likely a grey squirrel. 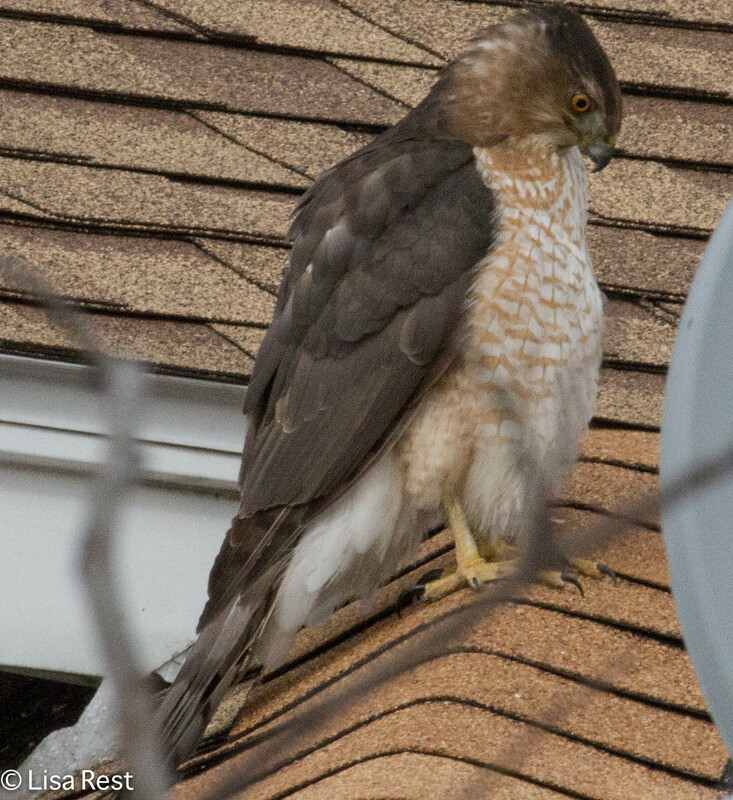 Then I realized the explanation for no birds in the yard was undoubtedly the presence of the Cooper’s Hawk on my neighbor’s roof, next to the dish. It wasn’t a great view but the bird was so close it was hard to resist taking photographs. And then even harder to crop out the dish. 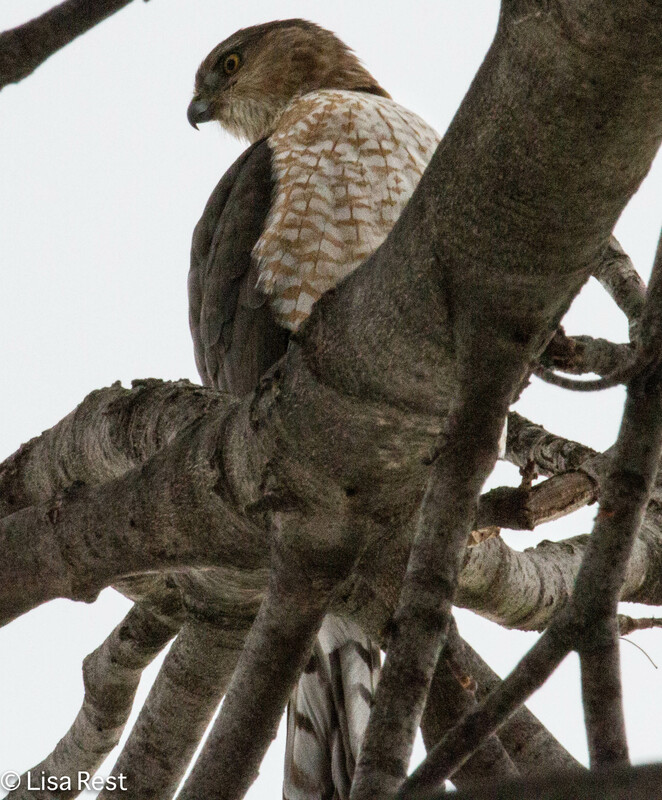 When the coop grew tired of not being able to hide there, it flew out front to sit in my neighbor’s tree. I haven’t found any telltale piles of feathers in the yard lately, but I haven’t seen hardly any mourning doves either. It will be interesting to see how many birds survive this winter. There is one benefit to the snow cover, however: I have not seen a certain black and white cat for months. 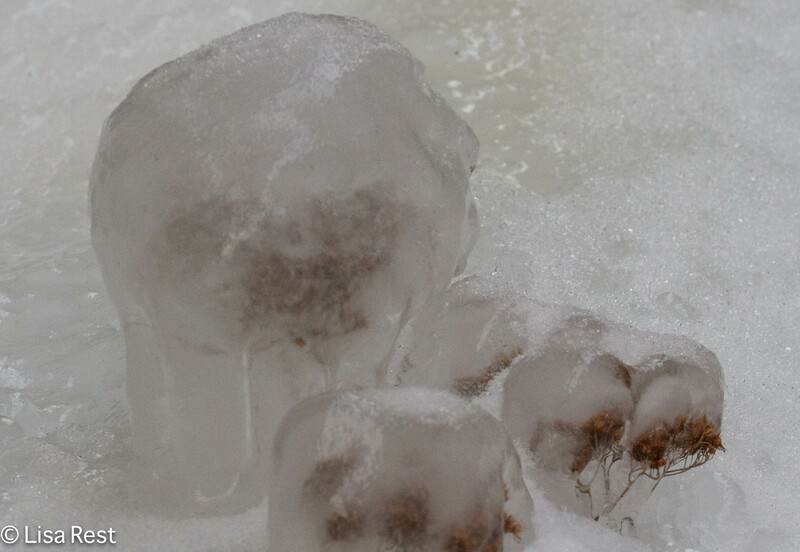 This entry was posted in birds, photography, raptors, Squirrels and tagged Cooper's Hawk, ice, sedum, snow by Lisa Rest. Bookmark the permalink. 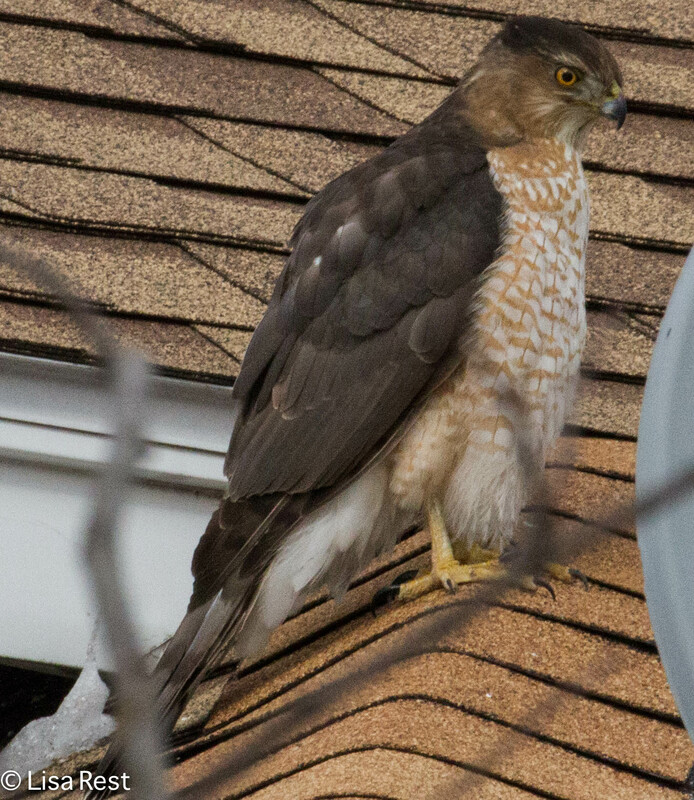 what a beauty..Cooper’s Hawks are always great..we have problems with cats..I have chased them from the feeders all winter long.. I love the Cooper’s. Actually I love all of the hawks. They made for an exciting afternoon for you. Love the pictures, Lisa. I am glad about the absent cat. I am too but I don’t know if I would trade not having the cat in the yard for lousy weather all year…!